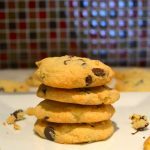 Perfect almond flour chocolate chip cookies and healthier alternative to traditional versions. In a bowl, mix the almond flour, baking powder, vanilla extract, cane sugar and pinch of salt. Add the softened butter (not melted) and mix well all the ingredients by hand. It should form a thick dough that is hard to stir. Add the egg and mix again. The dough should be easier to mix by now. If needed, add a teaspoon or of water to thin. Finished dough should be easy to form. Add chocolate chips and stir by hand until incorporated. Form round size cookies and bake on top of parchment paper for about 12-15 minutes or until cookies start to be golden brown. The cookies come out kind of soft, but they will continue to harden once they are out of the oven. Let cool at least 5 minutes and serve.